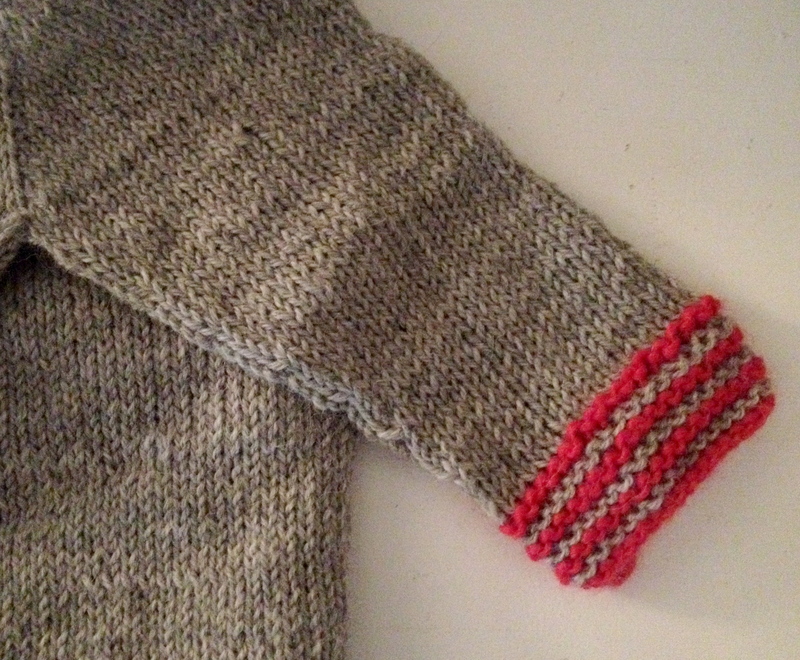 The cuff to a nearly finished project. Snaps after its completed and gifted out, of course. I have this habit of making sweaters. A lot of them, I have literally, a collar to finish, or buttons to affix; and instaed, I let them sit, languishing in a project bag, for months, sometimes years. What’s my problem? Project fatigue? Moving on to something else? Not loving how its turning out? Who knows. But this year, my goal is to be better; to start something, and to finish it. And to maybe make a sweater that I actually keep for myself. And wear it. Shocking, I know. But I will try. And so, this morning, I decided to grab my knitting design book, and craft some simple fair isle motif that I can work around, maybe the bottom, or the yoke, of a basic raglan pullover. 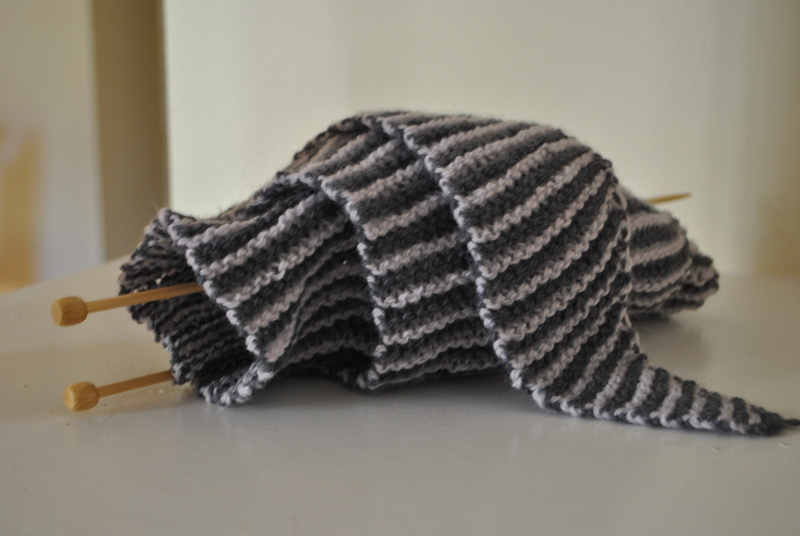 Something to spice up all the stockinette stitch. Something cheeky. Everyone knows my love for color work; and so, once I’m done some necessary knitted gifts with a deadline, I will make this. A basic raglan sweater, top down, in maybe a mauve colorway, with these little reindeer on. 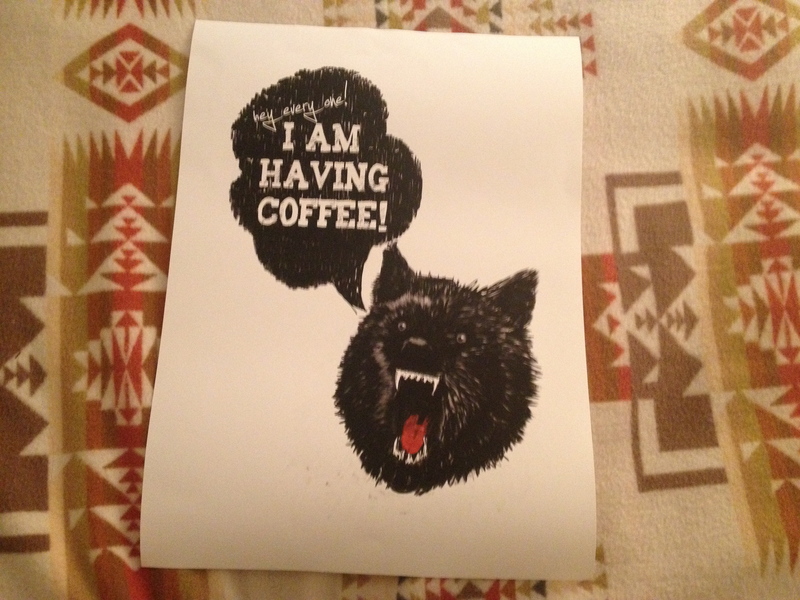 Sean sent me a surprise in the mail; this glorious society6 print of a wolf, letting everyone know he’s consuming coffee. I really dig it. I’m so thankful. It fits me perfectly. Now, to frame; and more importantly, where to hang? When you have a midweek holiday, why not cross stitch something up whilst in bed, but awake, quite early. Now that I’m on school schedule, I tend to rise naturally around 6 a.m. But seeing as we didn’t have work today, I thought it entirely unnecessary to get out of bed. 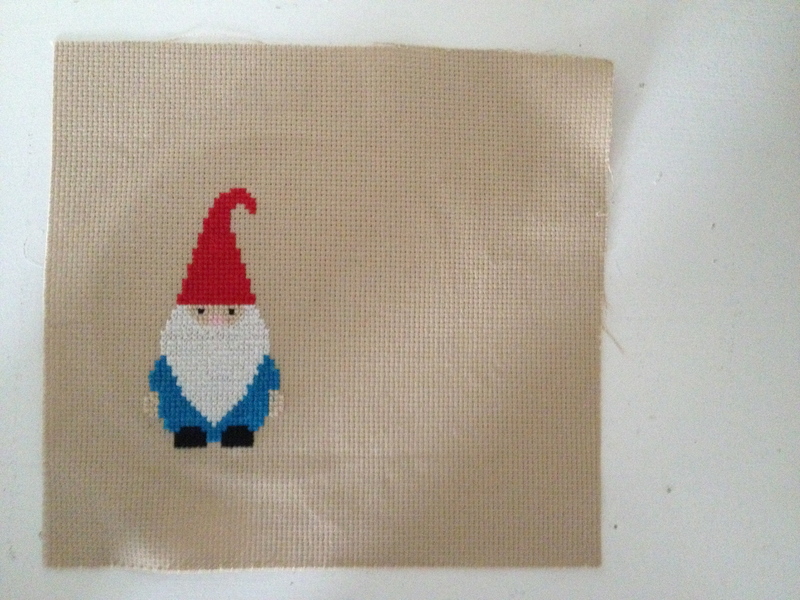 And so I cross stitched another one of these little guys between the sheets. The other night, my good friend r.r. summoned me outside Gather Here, one of my favorite stitch lounges owned by friend Virginia; it was to be a covert journey to a new space upstairs which Virginia was feverishly working in that night, while we were downstairs at her Thursday night pints and purls event we attend for just that–beer, knitting, nerdery, happiness, and maybe even, if we’re lucky, a pretty decadent interpretation of the Tracy Anderson Method (look it up, fools, if you were as unfamiliar as I was a few weeks back). Virginia is creating a genius little handmade empire and I swell with pride to think of it all. And as we walked down the shadowy street toward the stairwell that would lead us to Virginia’s new Annex–artist in resident space, class space, and finally, a real office for the lady at the helm of it all–I broke down in tears as r.r. grabbed me in a rare embrace. I couldn’t decide if I was frustrated that I’d been swept away mid cable and the mess I was about to head back to annoyed me, or if I was just feeling generally overwhelmed like I always am this time of year. Either way, she comforted me, and we began laughing hysterically as V. greeted us, me with tear-stained cheeks, in utter confusion. As we admired V.’s new space and reveled in the excitement of how brilliantly she’s delivered such a transformative, inspiring place for art, creation, experimentation, a little council of ladies emerged on what we do, how we do it, and most importantly, how and whether we’re even sharing it. I used to travel the scope of the internet picking up inspiration from millions of blogs just like mine. 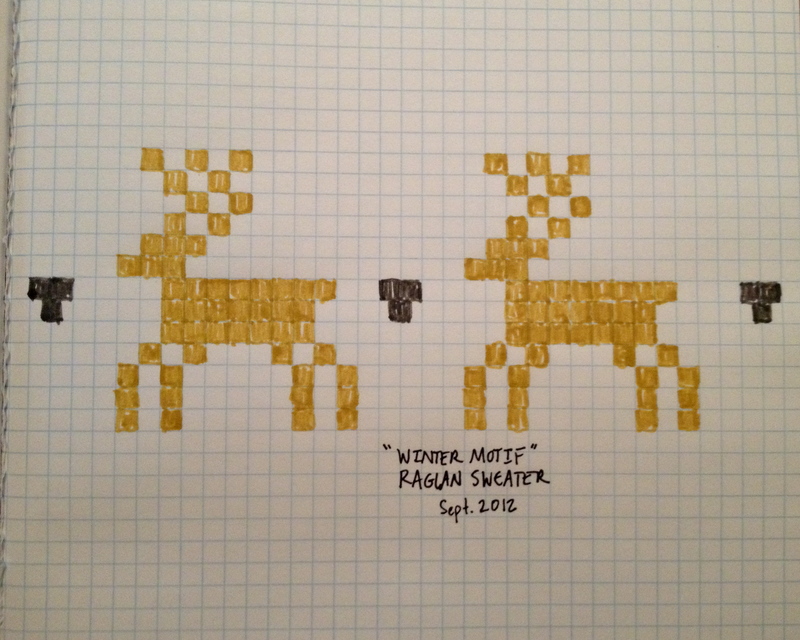 I admired, drooled, and immediately bookmarked things I wanted to do. I followed creators all over the globe willing to share and I looked forward to the daily little handmade moments in their life–dinner, a finished baby sweater for a close friend newly with child, and for instance, a cheeky way to organize your spice drawer. I felt a part of their lives, even when I wasn’t, and it inspired me to share the things I made, the ideas I had, the photos I snapped. And amidst the stress of designing and building a brand new space, V. told us about late night visits to our blogs–she read and read old posts, she found the original expression of r.r.’s first crush with Gather Here, and she craved more. But what had happened? Both r.r. and I have pretty much abandoned these spaces for more attractive and quick expressions of our work–instagram, that ever enticing way to quickly create, reigned supreme. 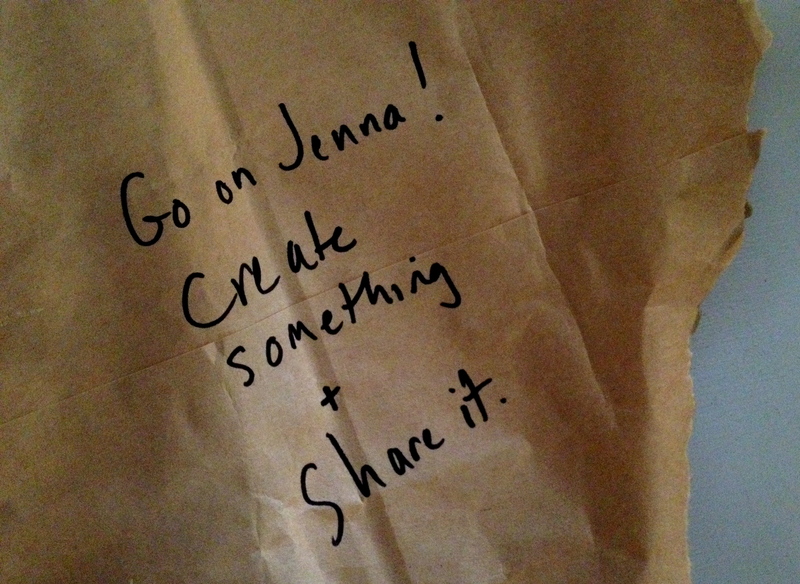 But as the weight of all that stress was let out of that ever-tightening balloon amidst ladies with power drills, bolts of fabric, and the anticipation of creative greatness, we made a pact: create, but really share that creation, with each other. Because as I find myself still making, the real desire to keep pushing on feels watered down, washed out. If I’m not sharing and looking at what others are sharing, I feel alone on a little island, and with that, I feel less impressed with my handmade endeavors. And its not about showing off your work and hoping for “oohs” and “ahhs”. Its the photographing of the process, the writing about the ups and downs, and the contribution to the collective ethos of handmade nation. So, I pledged that evening to create more again. To push myself like I used to. To spend more time working on my craft and being proud that in this ever-tempting “pick one of our filters” world, I will use my own lens, my own unique filters, and I will again document it here. Here’s to you r.r. and V. May you continue to inspire me with your gorgeous work when I’m old (because we already know I’m gray).